Many companies have to face situations where related data is divided between different applications, generated at different times or across various departments for specific requirements. This fragmentation and specialisation across applications can cause problems when reconciling data with different encodings, technologies, and update frequencies, especially with respect to the cost of management and integration. It is extremely simple to enable or configure features regarding the consolidated data to complement the database with any additional information, analyse and query the consolidated information, and manage exceptions; it is easy to adapt information according to the profile of who is requesting it (with multi-language and multi-country support), manage workflows, represent information graphically, etc. These features have been successfully implemented in real situations to simplify compound and heterogeneous application contexts consisting of multiple custom systems, resulting in significant cost benefits. A major best practice initiative by a major customer saw the replacement of numerous custom systems, that had been deployed over time to resolve specific process needs, but subsequently totally replaced by EcosAgile in a few short months of simple configuration work. Another significant example involved the consolidation of data, from heterogeneous external systems through EcosAgile, thus building consolidated base data for reporting activities; the flexibility of EcosAgile made it easy to add functions regarding the control and cleaning of data; the fresh data was then streamed into other systems for a previously unthinkable level of quality and consistency of internal reporting and BI tools of enormous benefit to the client. In some international scenarios, central information systems often implement broad and general processes which do not respond to specific local needs. Companies in this context often have to either absorb the costs associated with manually processing complex, local requirements not covered by the central system or develop custom, ad hoc applications. Both options are expensive and ineffective. 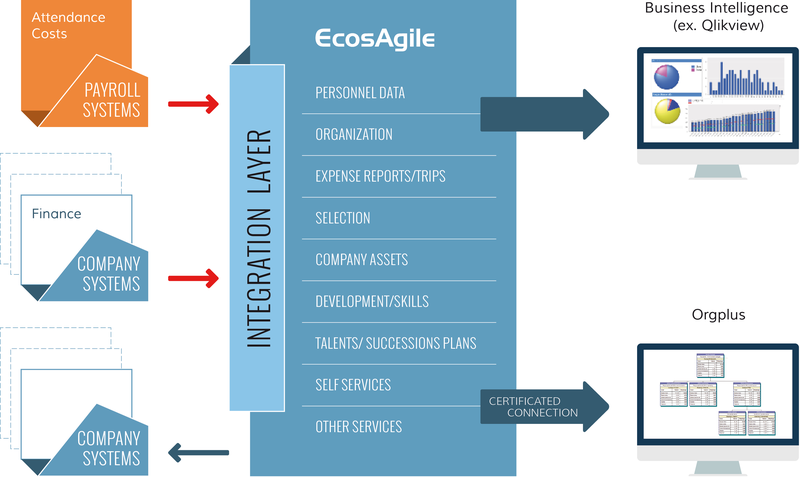 EcosAgile offers a unique solution to these contexts because its flexibility allows it to be easily annexed to existing Corporate and/or Global systems, and provide locally integrated platform which is flexible and versatile.. When compared with custom developments, EcosAgile features unbeatable quality, security, cost savings and speed; its range of processes often represents a powerful acceleration factor and it can be incorporated as a slave to other principle systems. be happy to help you explore how the same can be done for your business.